This isn't an Airsoft review just yet but I will be reviewing the WE SCAR Gas Blowback 6mm Airsoft Rifle next week, I just purchased this one used from another fellow YouTuber "FuzzyDicePimp" who was gracious enough to sell me his. 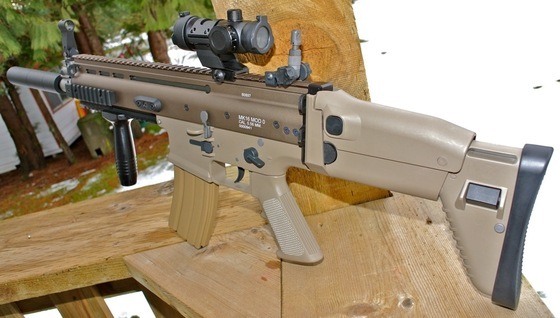 You will have to bare with me a bit on this first review as I more experience with Airguns so I think my first Airsoft review may be a bit more of me comparing the WE AWSS SCAR-L to my airguns but then again I don't really have that many tactical rifle styled air guns to compare it to. 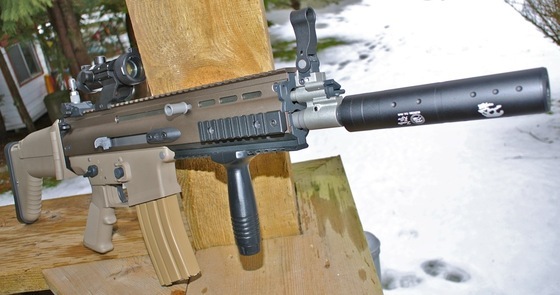 The WE SCAR I am reviewing is a generation 3 with the closed bolt system, it came with a gas magazine but I purchased a couple of CO2 mags as that is more what I am use to. So we will see if I can get a propane converter and I can do a comparison of the two magazines in my review. My first impression of this gun is "WOW" FuzzyDicePimp sent it to me with some juice in the magazine so I shot a few rounds through it. I had some .12 gram 6mm Airsoft BB's lying around and I also had some 6mm steel ball bearings, both of these really seemed to shoot hard and the blowback on the WE SCAR is very solid. Check back next week for more on this very nice Airsoft Rifle.